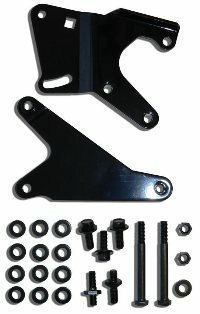 Saginaw PS Mounting Bracket For B/RB/Hemi Engines Designed after '68-'72 Design Performance Application, Some '73-Later, Aluminum Water Pump Housings & Pre-'67 Housing Require Some Spacing Adjustment. Use w/ Saginaw Pump w/ Nutted Shaft or Press On Shaft. Works w/ BPE9016 & BPE9017 P.S. Pulleys and Fits Most Big Blocks w/ or w/o A/C. Powder Coated Black.